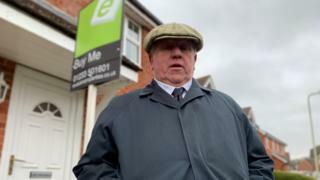 Image caption Fergus Wilson says there are two types of tenant - "those who agree with me and ex-tenants"
Hundreds of people face eviction after a controversial landlord decided to sell his entire property portfolio. He and his wife Judith own about 300 properties across Kent. Their buy-to-let empire has made them multimillionaires, but the Wilsons have become infamous for their strict rules on who they will allow to live in homes they own. Mr Wilson insists the landlord is in charge. "Basically, we have got two types of tenants - those who agree with me and ex-tenants." The tycoon has spent the past few weeks filming with Panorama. He said he wanted to give a landlord's perspective on the UK's housing market. Image caption Fergus Wilson told Panorama's Richard Bilton: "I can do what I like. You don't want me to lie about it, do you?" He believes we need to build more housing. In England, more than 10 million people now live in private rented accommodation, but Mr Wilson says private landlords cannot cater for all. "Not everyone on housing benefit is a problem, but every problem is on housing benefit," he says. "The problem is, they don't get paid enough in benefits from Her Majesty's government to pay the rent. 'What you have to understand is that the private-sector landlord does not have a duty of care. It is the local council who has the duty of care." Fergus and Judith Wilson bought their first buy-to-let house in 1991. At one point they owned nearly 1,000 properties. They say they've provided homes for about 10,000 tenants over the years. The couple say they hope to sell their properties to investors who will retain the tenants, but they have already issued 90 eviction notices - and more will follow. "I can do what I like. You don't want me to lie about it, do you?" It is relatively easy for a private landlord to evict someone. Most tenants are on six or 12-month contracts. Once that agreement is up, a landlord can evict a tenant for no reason with just two months' notice. It's called a no-fault, or section 21, eviction. Ellen, who is one of the Wilsons' tenants, lives on a street where they own all the properties. She doesn't know whether she will be evicted or be able to keep her home. "Our life depends on whether they sell or whether they stay," she says. "We have no say in it whatsoever - no security." Shelter chief executive Polly Neate said: "Lots of landlords are great. Fergus is an extreme example, but he is a really good illustration of how easy it is to prevent people in private renting from being able to put down roots. "The insecurity this creates - particularly for children - it's incredibly damaging." Nationally, the average tenant stays in a property for four years. In Ashford, Hannah, a teacher, got hers in the run-up to Christmas. "I was devastated, genuinely devastated," she said. "You've got millions in the bank, and you're evicting people over Christmas? Not impressed." Last year Mr Wilson was taken to court by the Equalities and Human Rights Commission after he told a letting agent: "No coloured people because of the curry smell at the end of the tenancy." He says his policy wasn't racist. "The people prosecuting me… made the point, 'We are not saying Mr Wilson's racist. We are just saying he mustn't do it'." The properties owned by the Wilsons will be sold off street by street. The couple say wherever possible, they'll avoid evictions, but many people will have to lose their homes. Fergus Wilson is characteristically blunt. "The landlord rules, not the tenant. But I think you've worked that out, haven't you?" You can see more on Panorama: Britain's Most Controversial Landlord, on BBC1 at 20:30 GMT on Monday 18 March and later on the BBC iPlayer.